and when nearing the end everything comes at once! time to share some updates with you and also our kitchen design! First I want to show you this kitchen I recently found. . . isn't it charming! roosters, silver, ironstone, blue and white plates hanging on the wall...so cute! 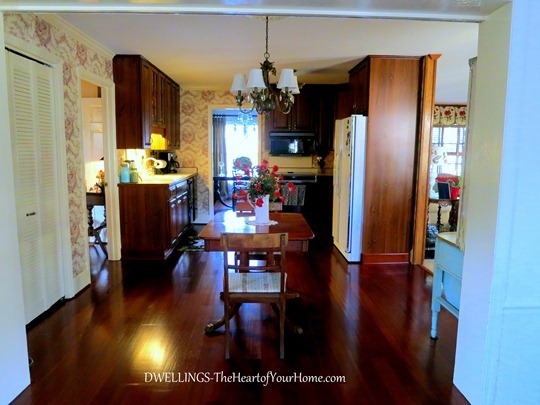 Our Dining Room is on the left as you enter our home and the kitchen is next to it. 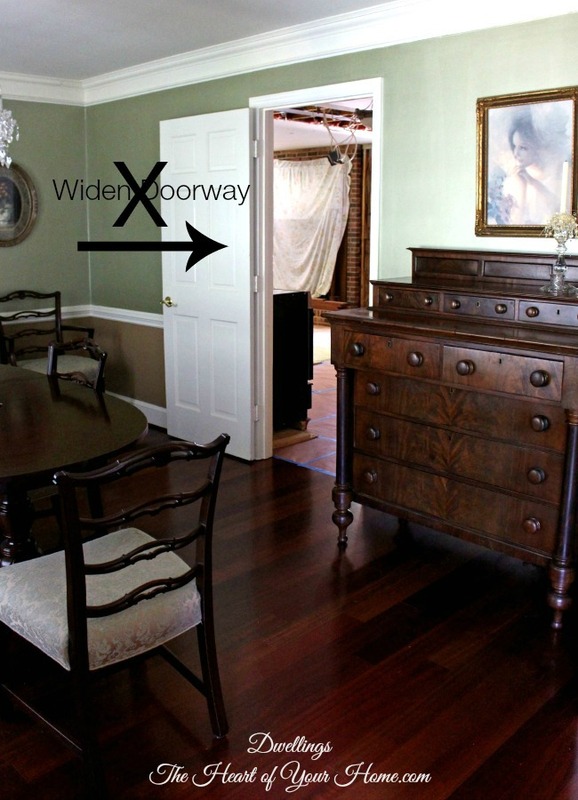 one opens to the den, great room, dining room and another to a guestroom hallway. 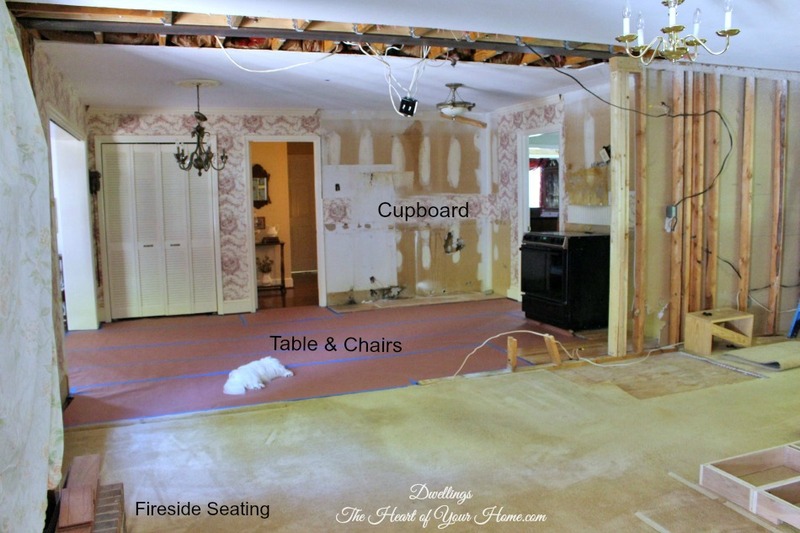 When making plans for the remodel we thought about widening the dining room doorway and not replacing the door so there would be a large opening between it and the kitchen area. 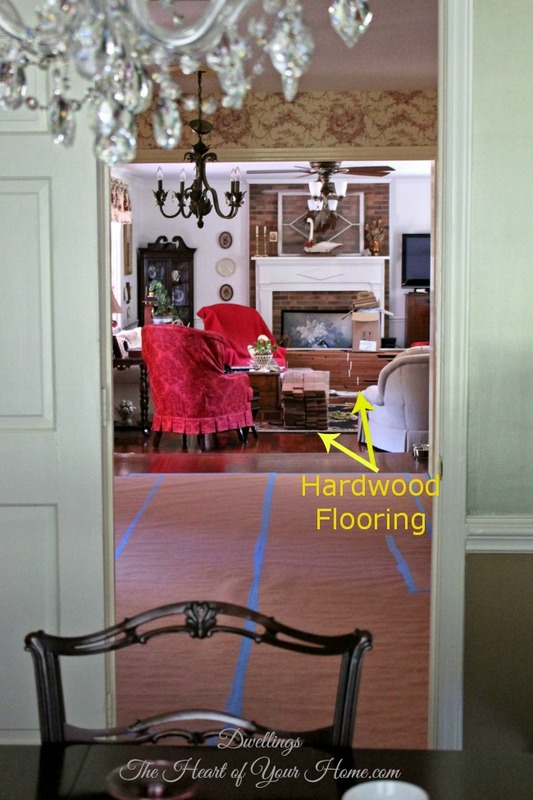 you can see the hardwood flooring that was delivered weeks ago. and after stepping over materials we can find a little space to sit. There is literally no where in our house that hasn't been touched by this remodel...it's a mess! which we are combining for our kitchen and keeping room. ~the old cabinetry, sink, microwave and fridge had been removed...everything except the stove. ~ wall between the old kitchen and den had been removed and the Support Beam installed. ~ and the plumbing had been completed. 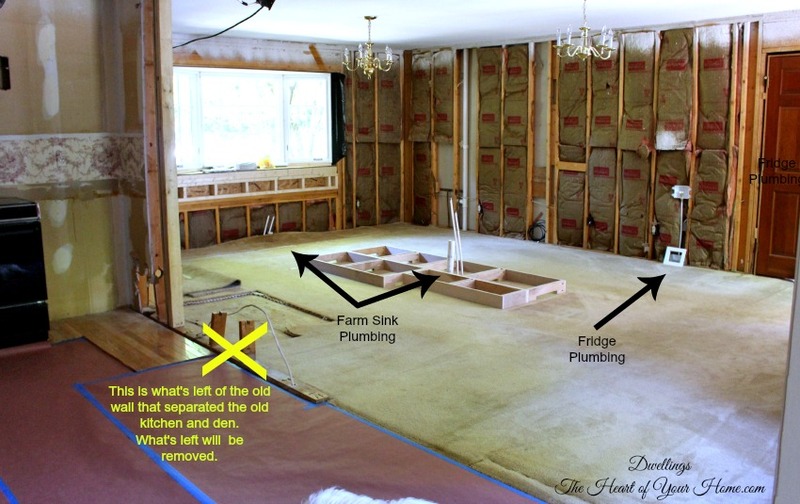 The yellow X is what's left of the wall that used to separate the kitchen and den. The other arrows indicate where the sinks and fridge will be. This next view is from the far side of the den looking back into the old kitchen area. 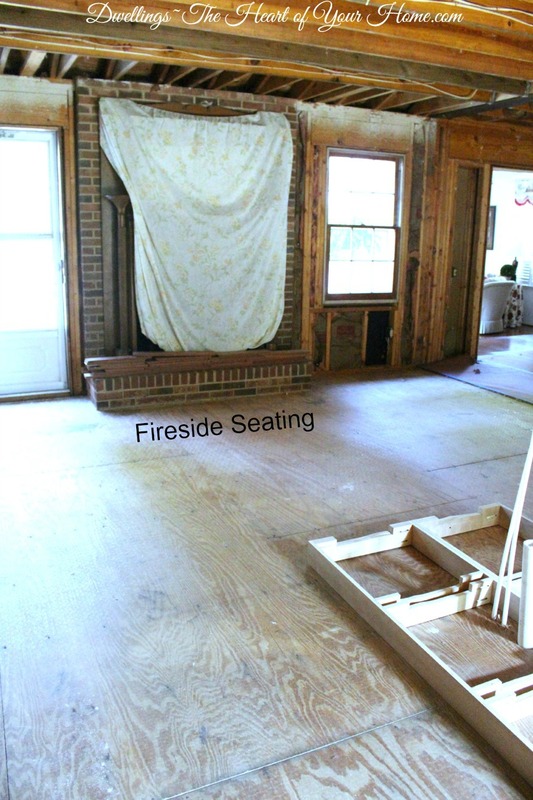 Taken from the front window you can see the fireplace and a cupboard will go on the left wall by the back door. 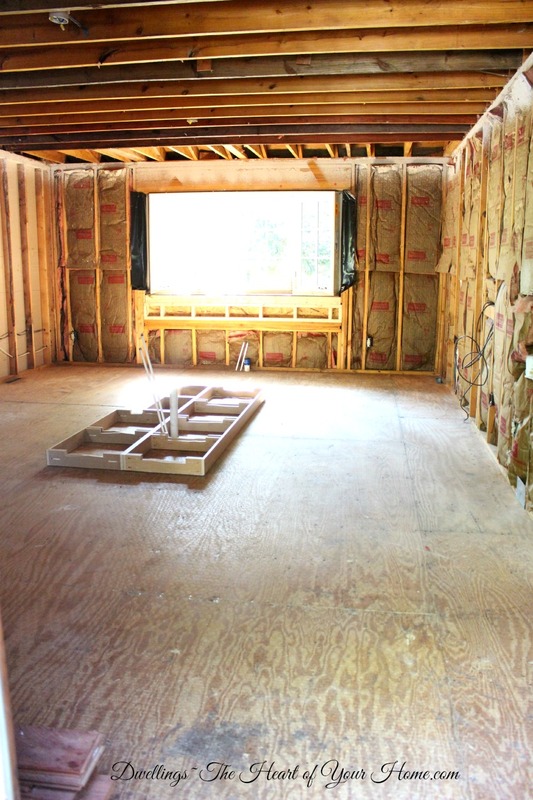 Once all the debris was cleared away the room now looks like this, bare to the bone! Here are a few drawings of our kitchen design. Some things have changed since this was drawn but not too much. This is the front window view. On the far wall is the rangetop and fridge. This is the rangetop side of the island. This is the oven wall side of the island. We sure hope that when all the dust settles it turns out well. 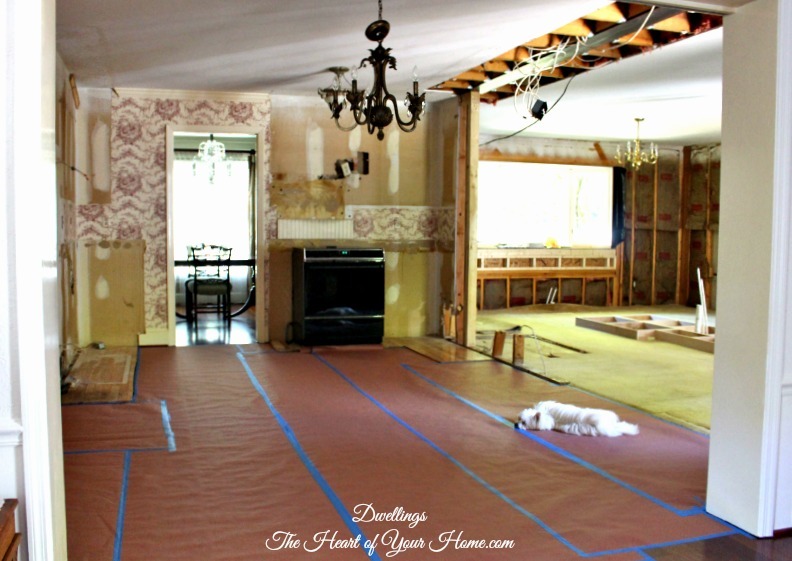 ~~The kitchen and den areas, where it all began: A Kitchen Remodel ~ Come On Along! We are just entering the renovation of our bathrooms amd walk in closets so now I see what we are in for. I think your kitchen will look fabulous. Hopefully we can do our kitchen in the spring. Holy cow! I absolutely can't imagine going through all of this, or the expense. Yikes! It's going to be beautiful, and I knew it would be. I hope you survive. This is the stuff that breaks down autoimmune systems. I am so exited for you, Cindy! I know it is hard to live sans kitchen, but when that dream kitchen goes in, all of this will be worth the hassle. It will be WONDERFUL, and you deserve it, my friend! wonderful to be able to recreate what you want instead of living with what doesn't work for you. 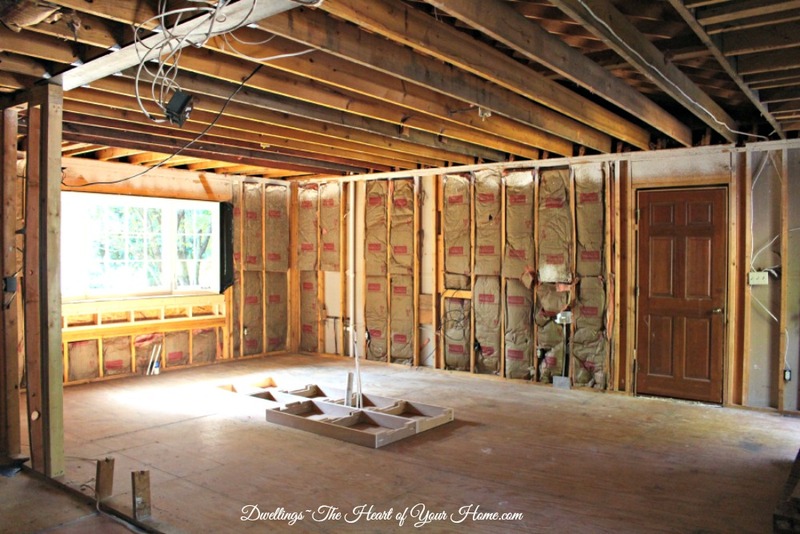 I can't wait to see the finished kitchen, as I'm sure that goes double for you! Cindy it's going to look AMAZING!!! Can't wait to see it complete! I am so excited to see your kitchen progress. It's looking great and these months of inconvenience will be well worth it when you have a brand new kitchen to enjoy! How exciting...no doubt it will be beautiful! Have a blessed Sunday! That kitchen photo is one of my faves, too. I love your new design and I know you can't wait for the end! Wow, Cindy, it's going to be amazing! I know it can be so exasperating and feel like it will never be finished, but it will all get done and you WILL survive! Cindy, this is going to be beautiful when you are finished! I love how open everything is! You're almost at the finish line! 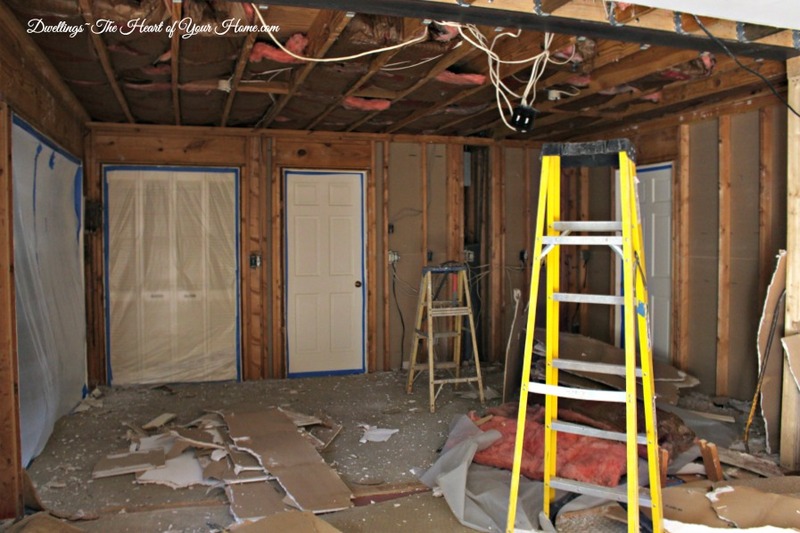 (I remodeled a kitchen from floor up once in my life and I said I'd never do it again--lol! 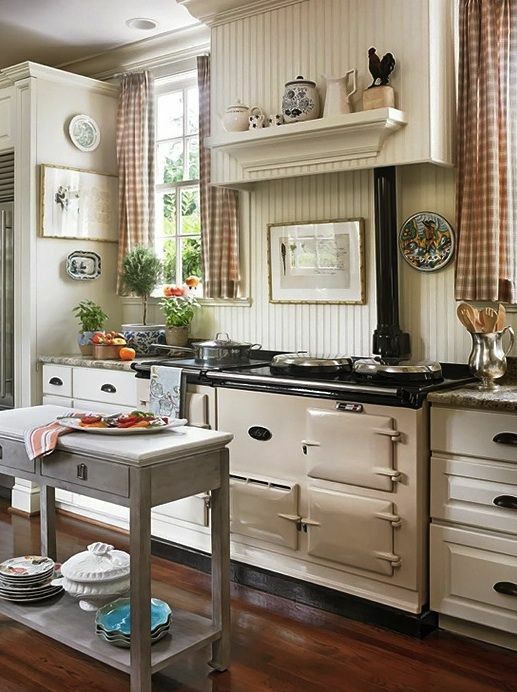 I do love this country kitchen that you've shown. It's so warm and cozy. I am looking forward to seeing the end result. I know it will be gorgeous and functional. Wow! I'm sure impressed, what a lovely, lovely country kitchen. 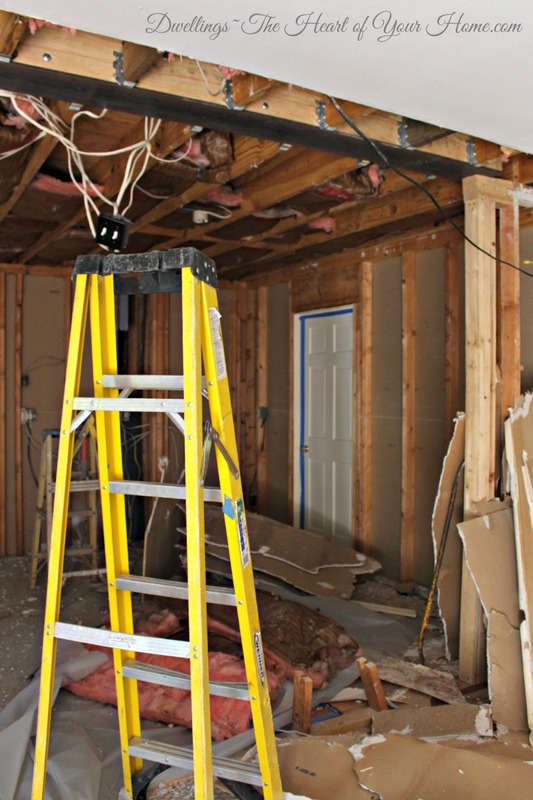 We lived through a kitchen remodel and bathroom remodel a few years back and I didn't know if I would survive. But, I did and it was nice. I can't wait to see the end result. We're in the midst of having our cabinets designed for our new house and there is a whole lot to think about. Happy week! 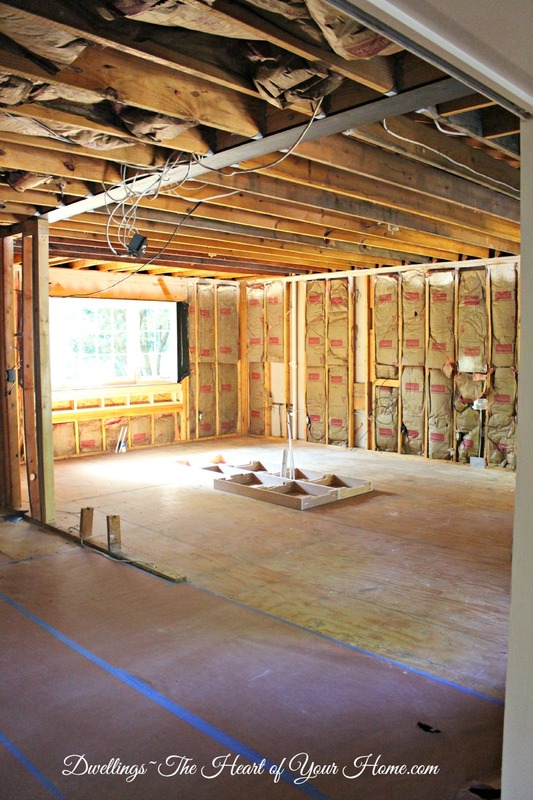 This renovation is going to be simply amazing!! !...I love seeing the plans...looks so beautiful and I love the island...can't wait to see it completed! Have a wonderful week! 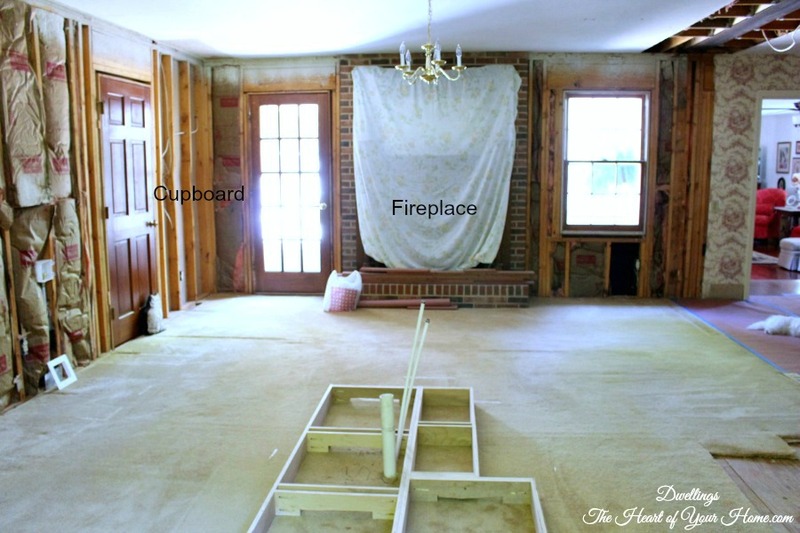 I feel for you as I know seeing your own house bare to the bone is very difficult... But the project is so exciting. Your kitchen is going to be gorgeous. I love all the views you showed of it! 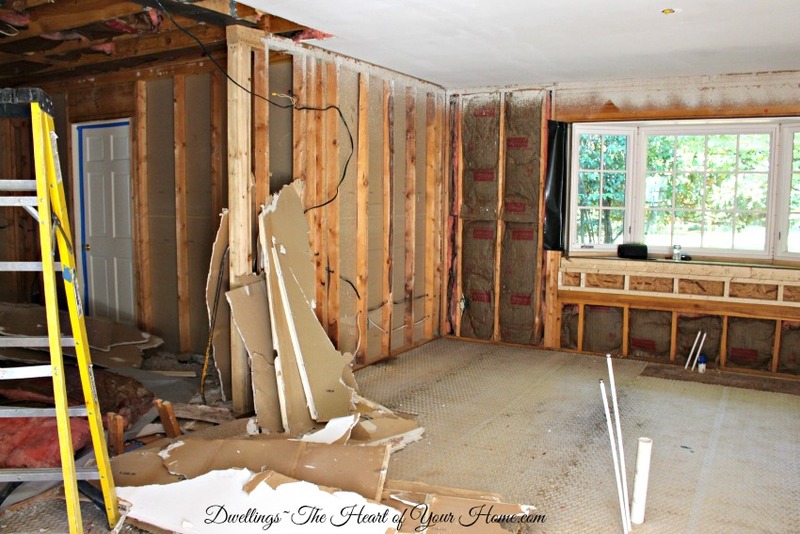 There's been so much careful and meticulous thought put into your remodel, Cindy, and this post is only a snippet of all the planning and work so far, I'm sure. The photos of inspiration are beautiful and your combination of the best from each to design your own is something to look forward to. Patience...it took us 8 years to build our home, and the kitchen, (my favourite part of my home), was the last room to go up! Compared to me, you're laughing! 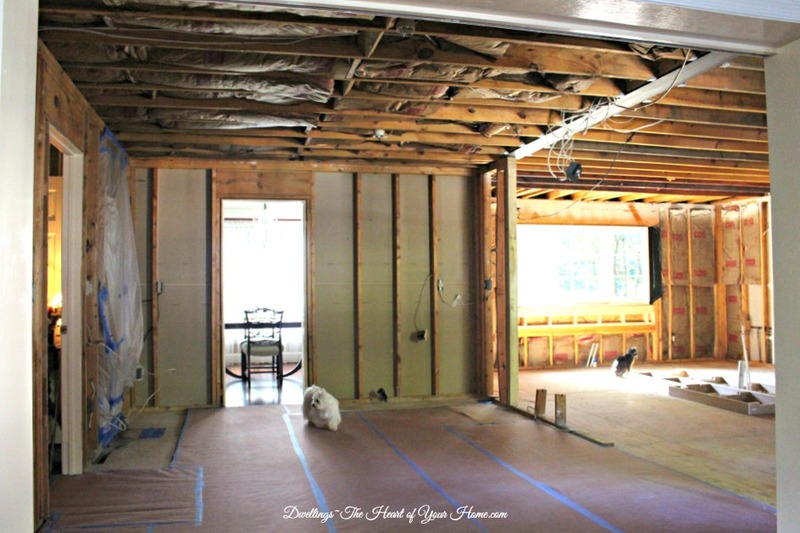 Wow your kitchen is going to be fabulous! Love that big bay window- you are going to love that so much! We remodeled in 1996 and I know exactly what you mean about how it goes. At times I had so many people here I felt like I should have a hard hat on and carry a clip board! I loved it though and it didn't stress me out, but I was younger! 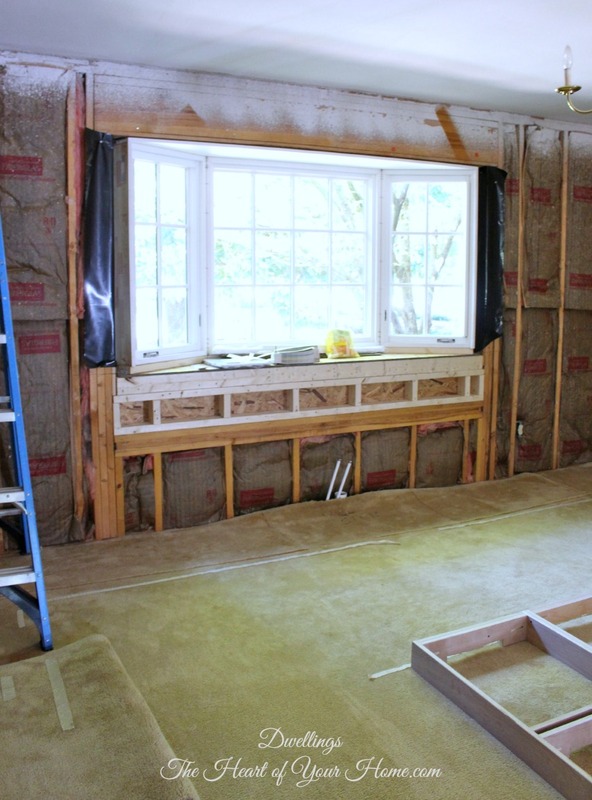 It's really going to be a wonderful kitchen when you are done! Oh, wow!!! I love every bitsy detail.........what fun and what a delight to bake and cook in there!! You are one lucky lady for sure.......love the fireplace, nice to sit and have a cup of tea there!!! My kitchen remodel in the big house took 2 months....I was cooking meals in an electric fry pan in the laundry room!!! Hang in there!! 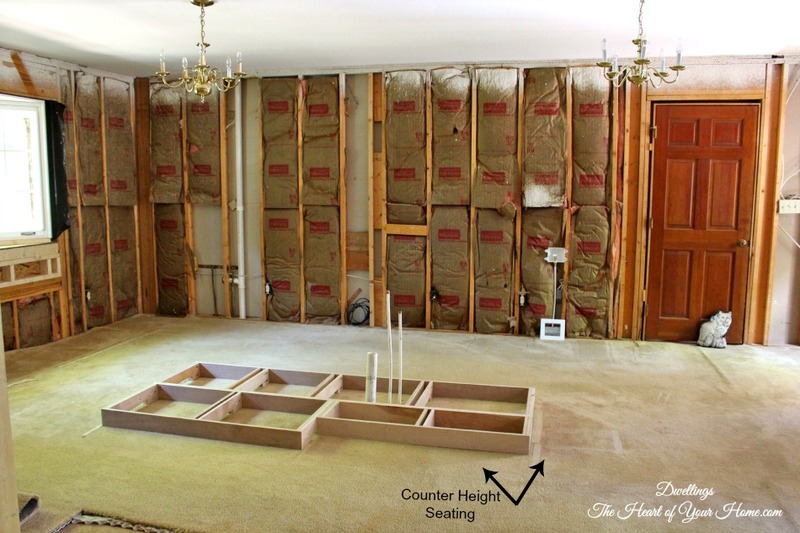 Cindy, your kitchen is going to be so amazing! I can't wait to see the progress as it continues. 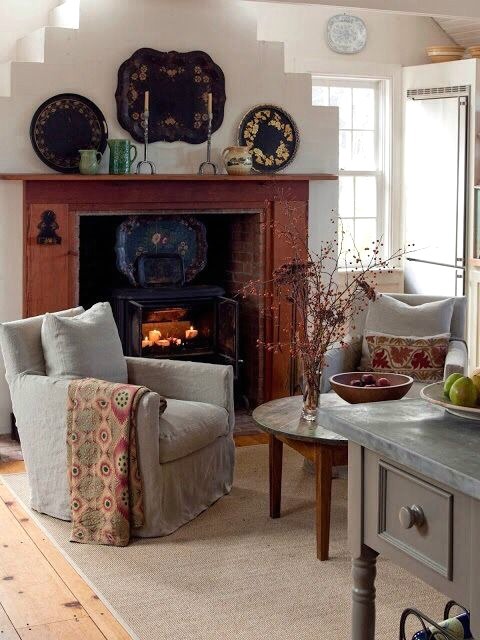 I have always loved the keeping room concept with a fireplace! It's going to be amazing. I can't wait to see it once it's done! I'm trying to talk mu hubby into a kitchen demo. 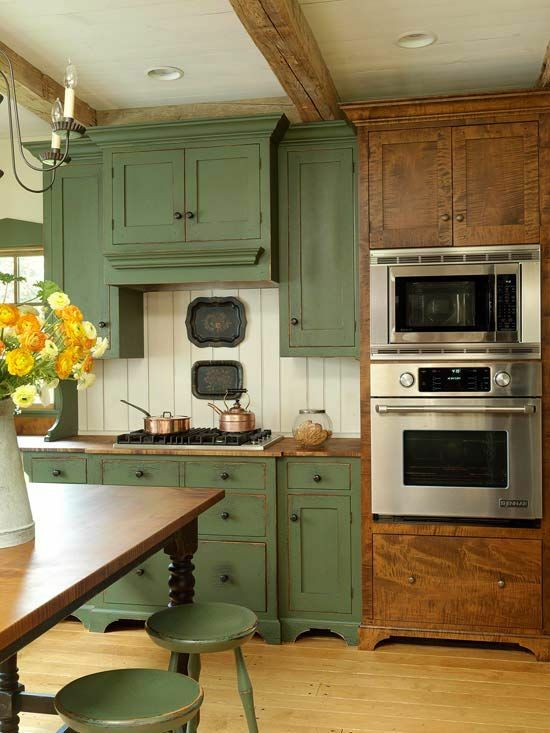 Could you please tell me the,color you painted your cabinets and bead board?